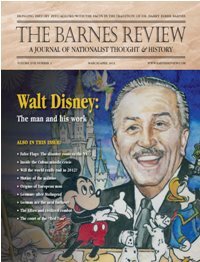 I just obtained the latest issue of The Barnes Review, a white nationalist and holocaust-denying publication produced by Willis Carto. Let’s crack it open and see what’s inside. The cover story is about Walt Disney. Paul Angel (TBR’s Managing Editor) and Vince Ryan (TBR Board Member) tag-team the editorial introductions to this issue. Both of them focus on a book called “The Work of All Ages,” by a Peter Christian, which is being heavily promoted by TBR. Angel says that the book documents a “nefarious plot to control the world” that was “formulated way back in biblical times and proceeds unabated to the present,” but tells us to look at Ryan’s piece to see who the perps are. Ryan fingers the Jews, of course, and warns that their “sole business is to pursue, against any and all odds, their goal of world conquest which they have been plotting since ancient times.” Way to hit the ground running with this issue, guys. Merlin Miller writes the cover article, “Walt Disney and the American Dream” (p. 4), a hagiographic piece which contrasts Disney, who epitomizes everything good and wholesome, with Hollywood, which he describes as having been built by “Jewish merchants” who used “felonious tactics” to create and disseminate “racy and exploitive material.” This article is fairly short, but Miller has written at greater length about his contempt for the Jewish-dominated mainstream media in the Occidental Observer. Miller also wrote a short book called The American Dream, which regurgitates many well-trodden anti-Semitic arguments. We’re only up to page 11 of this issue of TBR so far. There’s more anti-Semitic goodness to come. Stay tuned. This entry was posted in Anti-Semitism, Anti-Zionism, Merlin Miller, The Barnes Review, The Work of All Ages. Bookmark the permalink.